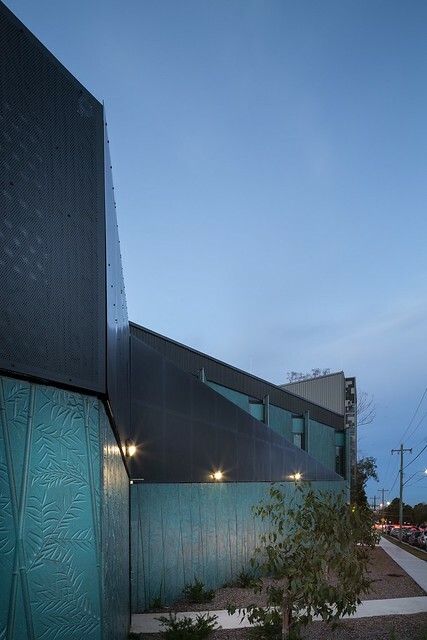 Austral Precast concrete wall panels in offform and PermaForm finishes, manufactured, delivered to site and installed. Built on the extensive campus of the Nepean Hospital in the outer western Sydney suburb of Penrith, the NMHC includes 64-mental health beds servicing high dependency, acute and specialist mental health services for older persons. The unit includes a dedicated inpatient ward and new facilities for the outpatient day program.The design creates what the designers Woods Bagot call a “living architecture.” A facility such as this requires a hard edge for security but the building, both internally and externally, must engage with the patients. The structure uses conventional commercial construction technology with structural steel columns, steel roof framing and concrete slabs. 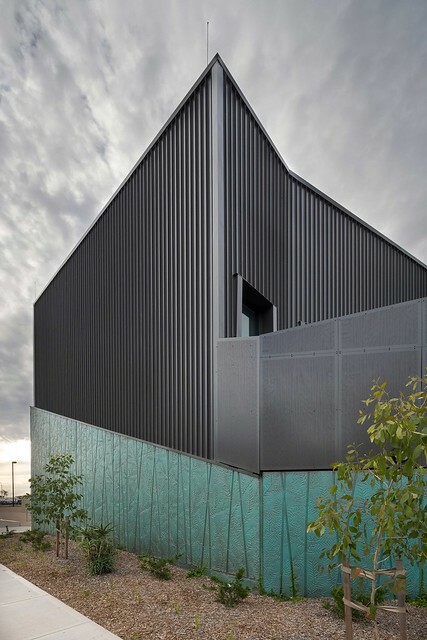 The extensive glazing, hard steel and prefinished fibre-cement panels relate closely to the adjacent hospital buildings. They contrast strongly with the non-institutional feel of the interiors, with large areas of glazing and comfortable lounges allowing a visual connection to the three therapeutic internal courtyards. Patients are encouraged to wander in loops through the courtyards and engage with the landscaping. Colour, texture and natural appeal help enhance the healing process.You may not have heard of salutogenic design. It’s the concept that the quality of the built environment has an influence on our health. This has been especially taken up by architects as part of an inter-disciplinary approach to the design of healthcare facilities. At first glance it may seem that precast concrete walling is the antithesis of a nurturing, healing environment but the mellow, tactile exterior walling of the Nepean Mental Health Centre demonstrates otherwise.Of course, the design of a healthcare facility must also consider treatment requirements and budgets (capital and ongoing), as well as patient safety and security. Precast concrete walling also helps tick many of these boxes. The most striking building element is the precast concrete walling, substantial areas of which are decorated with a bamboo pattern that is debossed (engraved) into the concrete surface. 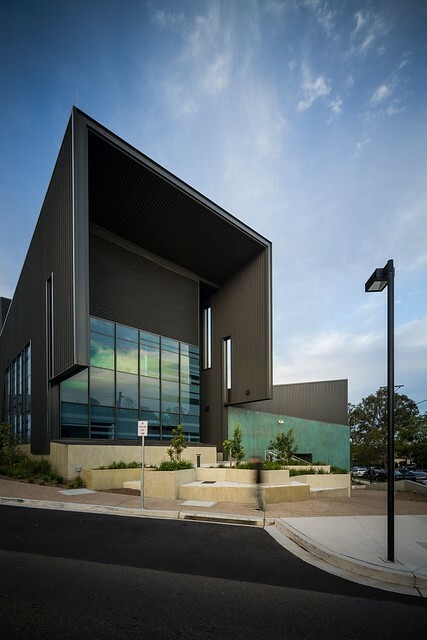 All precast panels (plain and patterned) are finished in a pleasant coppery green colour, applied on site using the Austral Precast® PermaTint process. The use of the green, patterned walling is most effective around the building entrance, on the long street elevation and most especially in the therapeutic courtyards where the colour and texture blend happily with the landscaping. It’s well accepted that colour has a direct effect on a person’s wellbeing. You can see it in our language: colours are judged as warm or cold and we talk of feeling blue, seeing red or being in a black mood. Green is the benign colour of nature and has long been favoured as a positive colour giving permission and safety – think green light, green card, green room, green with envy. The Nepean green was custom-formulated to an approved sample. The gold-bronze base is topped with a non-metallic weathered green. In certain lighting conditions the metallic base colour becomes more prominent. The concrete panels were cast on automated tables at Austral Precast’s state-of-the-art facility in Wetherill Park NSW. The bamboo pattern is the result of a rubber formliner that is placed in the base of the casting form or mould. This is a process Austral Precast calls PermaForm, part of their PermaTech suite of precast concrete panel treatments and finishes. The formliner pattern selected by Woods Bagot design team –Henry Ahn, Domenic Alvaro, Tershia Habbits, Margaret Hardy, Greg Harper and Stephen Taskin– is called Ventanique Inverse. It’s from the extensive Reckli catalogue and made in Melbourne for the specific application. A remarkable range of standard formliner patterns is available, from abstract geometrics to brick, stone and timber and in a variety of textures, subtle and overt. Custom formliner designs, including logos, are also possible. Once the formliner is in place, steel reinforcement is positioned and finally the form is flooded with concrete. When cured, the concrete panel is lifted out and the formliner stripped away, ready for reuse. The 147 precast panels for the Nepean project were delivered to site and installed by Austral Precast. The company is proud to be able to offer a complete end-to-end service from design consultation through manufacture and finishing, to delivery and installation, all with one contract and one point-of-contact and total responsibility. While meeting strict budgetary, treatment, and safety and security requirements, the centre’s design concept also provides a level of humaneness and connection to landscape that will assist the patients on their healing journey. The Nepean Mental Health Centre was officially opened on 31 March 2014.